I decided to take advantage of the long weekend and bake something (also wake up without alarm clock, make plans and promptly forget them, spend an entire day in pyjamas). This recipe, from the Passover chapter of Florence Greenberg’s Jewish Cookery looked interesting and challenging (my relationship with things contains whisked egg whites being somewhat troubled). I have never eaten anything like this before and imagined it to be a bit like a giant macaroon. (The title should be a clue to keep an open mind. Would it be a cake? A cookie? A chocolate sandwich what?) 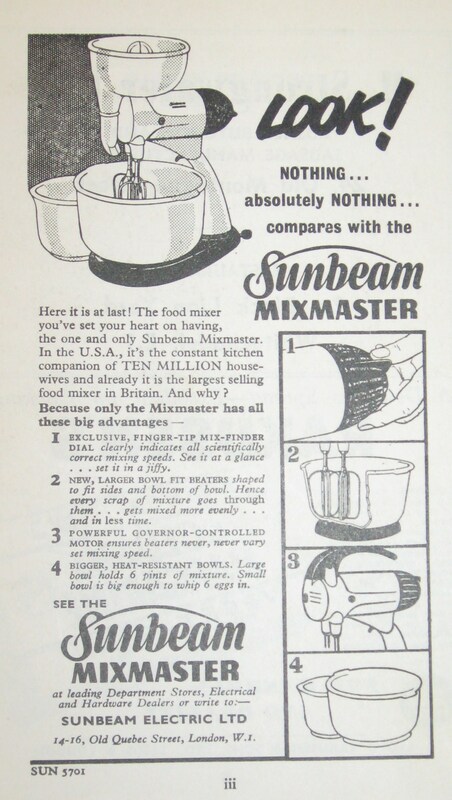 I had no qualms about pulling my food processor out to whisk the eggs as the book itself features an advert for the Sunbeam Mixmaster. A marvel! Truly one of the most delicious, most interesting things I have ever baked. The outer layer was crisp on top, and then fudge-y, like a brownie. The filling was light, flavoursome and almost creamy, with the right amount of chewy pieces of peel. 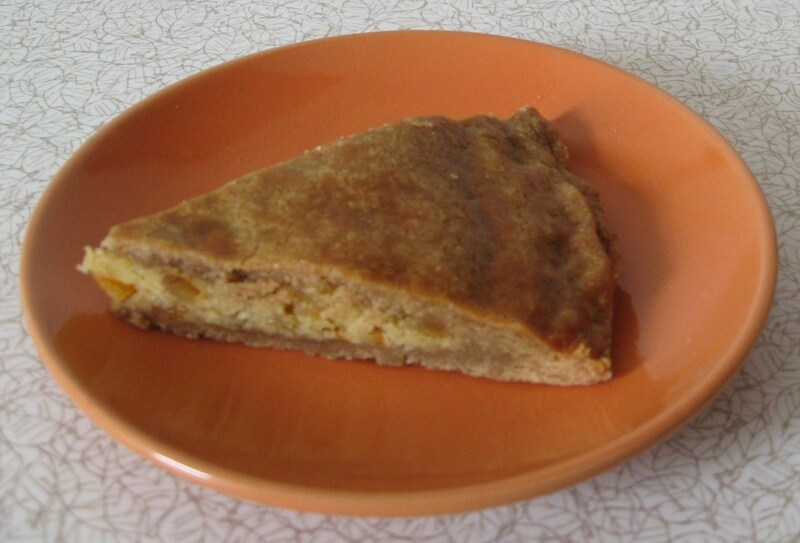 This is a rich cake, as you can see from the relatively small proportion of flour to butter and sugar, however, it is also wonderfully satisfying and stayed fresh for 2 weeks in a tin. I have since read variations of this which include making mini ones using a shallow bun tray and using raisins instead of candied peel. Inspired by Foodista’s recent newsletter about Passover cookery, I decided that, as promised, now was a suitable time to try Florence Greenberg’s cinnamon balls. I’ve never had cinnamon balls before, but love all the ingredients and was optimistic about the outcome. 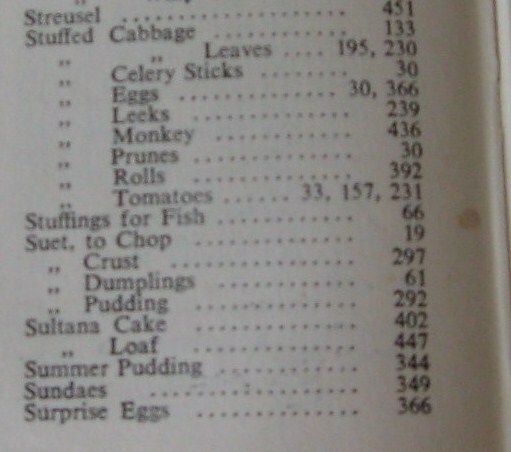 One of the many things I love about Florence Greenberg’s Jewish Cookery Book (first published in the 1940s, although I have the 6th edition from 1958), is the number of excellent baking recipes which require only simple ingredients, combined in appropriate proportions. I like a shmancy cupcake, as much as the next person who likes shmancy cupcakes, but it’s very satisfying to bake something good and easy and cheap, which relies on wit and not flash. Unfortunately this recipe isn’t quite that. Sorry this is being posted late! Events ran away from me towards the end of last week. As promised, another soup, and one you could conjure from store cupboard ingredients, (if you own a store cupboard, I took these items from my spice shelf, carb-drawer and the fruit bowl). I’m interested to see if it’s edible exactly as written or if these seven ingredients actually don’t magickallye combine into a tasty meal. 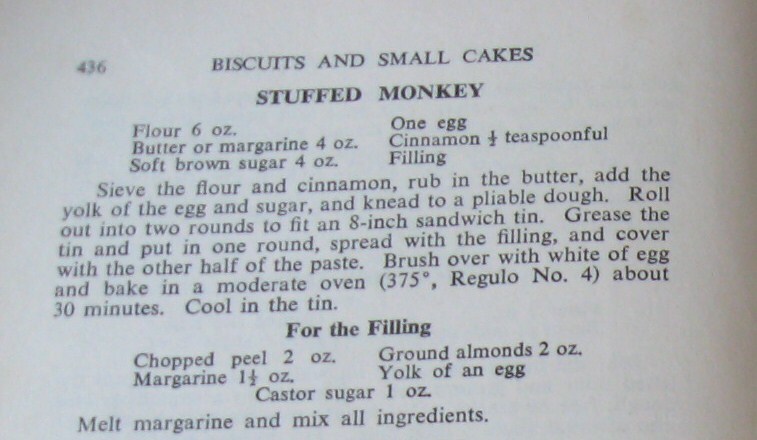 (This recipe is from Florence Greenberg’s Jewish Cookery Book, 6th edition, 1958). The first time I bought some lard to make the pastry for chicken and leek pie, a horrified thrill ran through me. Lard! I was actually buying lard and I was going to cook and eat it too! Though really, I shouldn’t have a problem with it – sometimes I eat Bacon Frazzles and heaven knows what they contain. So here, by request, is how to clarify fat and as a bonus, how to render it! Both methods are from Florence Greenberg’s Jewish Cookery Book, (1947). I have never done this – if you have, or if you go on to do so, let us know! NB. I have no idea how long fat processed according to either method can be stored and used safely. Caveat culinator (or something)!